How can i install my wordpress theme? Instaling theme is really?easy. First you should upload the theme to your wordpress site. You need a tool for uploading theme files to your website, you can use “File Manager” from cPanel or any FTP client. 2 – By WordPress? : In this method you can upload theme zip file directly from wordpress admin panel. 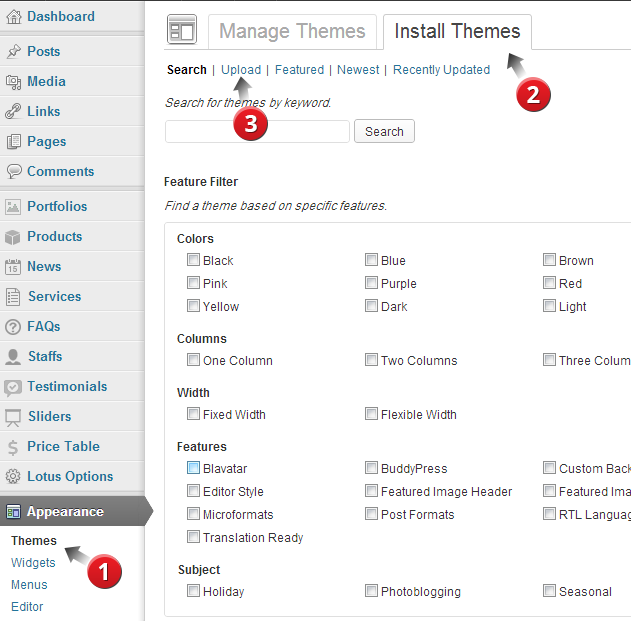 In wordpress admin, go to?appearance > themes > install themes. Browse theme zipped file and hit?Install Now. Your theme will be uploaded and installed. Note: ?If you want to use this method, The server that hosts your website must?allow upload file size greater than 20 MB. Most host providers have only up to 2MB file size upload limit. Great ! now you have installed your theme. Now you just need to activate the theme. go to appearance > themes, Under the theme screenshot , hit activate link. ?It’s done ! Important:?After uploading your theme, please hit ?Save all options? button in the Option panel because themes need to cache options.